But before I jump into sharing everything, I just feel like I need to share a little caveat regarding my intentions with this post. Like Christmas, Easter is a very significant holiday to me because of my faith and it’s important to me that we keep the focus on Christ’s resurrection vs. baskets and bunnies. But at the same time, I do love that seasonal stuff and it’s fun and spring-y, so I’m not opposed to it. However, I in no way want to write a post that comes off as I’m trying to over-commercialize this holiday and just focus on stuff when it’s really about God’s love for the world and that’s why we’re celebrating. But I realize that chances are if you’re like me, you’re probably doing some sort of Easter basket for your kids. And so rather than just put in a bunch of candy and random toys that are going to be forgotten about in two days, I thought I’d share some of the things that I’ve found that I felt like we’re unique and that I’m excited about. Because honestly, I love doing stuff like this! Gifts are my love language and so I love buying them, especially for my kids, and holidays are my jam and it’s a lot of fun for me to put their Easter baskets together. But if that’s not your thing, please don’t feel like I’m saying that everyone has to do some elaborate basket for their kids because that is totally NOT my intent. With being a mom, I think it’s totally awesome to lean into the things you love doing with your kids, and not feel like you have to do things that aren’t your cup of tea just to keep up. 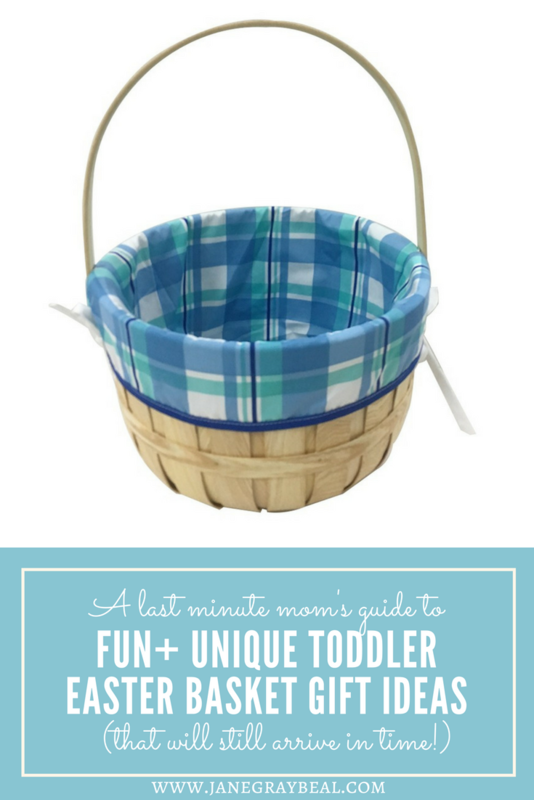 So now without further adieu, let’s get into these Easter basket ideas! I broke them up into two categories – books and not books – ha! Henry has always loved books and Charlie seems to really like them as well. So even though we already have WAY too many, I just cannot stop buying them because I know we’ll read them! Plus, because I am trying to keep the focus on why we’re celebrating, including some faith-focused books is a really great way to do that. So this isn’t actually going in the boys’ Easter baskets because I ordered it awhile ago and we’ve been reading it this month, but it’s a really unique one that I would highly recommend. It’s got gorgeous illustrations and explains the significance of Easter in a way that kids can understand. It’s geared more towards kids slightly older than Henry, but it’s a beautiful book with a great message to add to your collection! This is a sweet board book from the makers of the Jesus Storybook Bible, perfect for all ages. This is going in Charlie’s basket for sure! This is a book isn’t actually going in Henry’s Easter basket because we got it a few months ago, but I wanted to share it because we’ve been reading it and are really enjoying it! It’s also geared for kids slightly older, but I think it’s totally fine for Henry’s age too. (And we usually read one with our stories before bed and they’re short enough that Charlie doesn’t get too restless) It has 100 short devotions that each have a scripture/short message and it ties together with some science topic , and there are fun science facts included, which Henry loves. I’d highly recommend it! We have a few kids’ Bibles but I found this one at Target the other day and the illustrations are really lovely so I decided we should add it to our collection. I picked up this book because I thought the rhymes were sweet and the illustrations are whimsical. I also really like when I can find books where the central characters are kids that look different than Henry and Charlie because it’s a simple way to help them understand how God made people so wonderfully diverse! Clearly I’m drawn to books that have nice illustrations, but I thought this one was really lovely. And it’s also a large format board book which will be perfect for reading at bedtime. Henry and Charlie are at such a sweet stage where they really are becoming friends and they play together all the time. So I love getting books that encourage their brotherly bond! Plus, the illustrations and words in this book are super sweet and I think it’s perfect for Charlie’s basket. Since we don’t have cable (and I haven’t paid to download a bunch of episodes) my kids have literally seen two episodes of Paw Patrol. But since the stuff is EVERYWHERE, Henry has decided he likes it – ha! He always wants to open these little e-reader things every time we go to Costco so I think he’ll be pretty excited about this! And Charlie loves books with buttons that make sounds, so I got him one like this. As for the non-book things in the basket, I tried to think about useful/educational things I wanted the boys to have as opposed to just random toys and junk. I did buy a few little more trinket-y type items from the Target Dollar Spot that I can’t link, but for the most part, I tried to stick to things that I felt would have more longevity. And after a few years of doing Easter baskets now, I’ve realized I just need to say NO to Easter grass in the basket. I’ve done it in the past because I thought it looked cute but it’s a mess – ha! Henry loves to help me in the kitchen and he’s always asking to help me chop fruits and veggies. I started searching to see if there were kid safe knives and these nylon ones came up and had tons of good reviews! He obviously hasn’t used them yet, but there were reviews saying people let their two year olds use them with supervision, so they seem pretty safe? They’re also super budget-friendly and dishwasher safe, a win for sure! Henry loves doing art, but he also tends to want to change gears quickly, so sometimes it’s frustrating to get out a bunch of paint only to have him decide he’s over 5 minutes later. These paint sticks have great reviews but look much quicker to get out and put away! These are our favorite water bottles and we have quite a few, but I can’t resist getting more when I come across cute designs like this mountain one! And since it’s a lot harder for me to come up with ideas for Charlie’s basket, he’s getting this in his – ha! So this isn’t going in their Easter baskets, but it’s something we purchased recently and have been enjoying. Henry loves maps I found this little magnetic map puzzle at Costco that came in a set with this clock puzzle. (You can purchase them separately on Amazon) He’s been playing with them both a lot lately which is why I wanted to include them! These are really awesome for travel, you can form them into all sorts of shapes and Henry loves them! They’re just little wax sticks, but they really can provide hours (or at least minutes, ha!) of fun. They wouldn’t be good for Charlie’s age group aka younger toddlers that still want to put things in their mouth, but for older toddlers, they’re awesome! And then I also got them each a t-shirt for their Easter basket, these were just ones that I liked and picked up on my last Target run! Last but not least, I wanted to share the links to the boys’ baskets and their Easter outfits! In the past, they had baskets from Target, but they were kind of flimsy and didn’t hold too much. I considered looking into getting personalized ones with their names, but I saw these at Target (it’s the one featured at the top of the post) and thought the plaid liner was really cute and they seemed pretty sturdy so I just decided to go for it. As for their Easter outfits, I was actually found them at Costco – ha! They’re not available online from Costco, but the brand is Andy & Evan. (Here’s a link to something similar!) And neither of them had any shoes that would work with their Easter outfits, but I didn’t want anything too dressy that they wouldn’t wear again. I ended up finding these cute shoes at Carters that I got buy one, get one free. They’re a little casual, but I think they’ll work and they can hopefully wear them a lot this spring! Hopefully this post might be helpful if you’re still on the lookout for Easter ideas, I can’t believe it’s next weekend! The links used in this post are affiliate links, meaning, at no additional cost to you, I will earn a (small) commission if you click through and make a purchase. However, everything I’ve included are products I purchased with my own money and am excited about!